Life interrupted and I didn’t get the quilt sandwich together as I had planned for last Friday. So instead I made this small wallhanging (19 1/2″ x 24″). The wolf is a laser cut fusible applique from Lisa Moore (http://quiltswithatwist.com/products/wolf). Cutting the hand dyed fabric was a bit tricky since it was lighter along the selvedges, but I think it looks great. 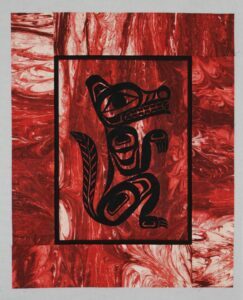 I tried the black wolf on a lighter red hand dyed piece of fabric, but the overall look was washed out. Not what I was expecting at all, but isn’t that how it goes? Once the Mini Wolf was completed, I decided to finish the blocks and borders so that Charlotte’s Baskets was a completed top. When I started this project as a leader/ender I planned for it to be a charity quilt. Even when the quilt center was finished I felt the same way. But now that the inner and outer borders are on, I have decided to hold on to this for awhile. It may still end up a charity quilt, but not immediately. While deciding on the border fabric, I had three goals in mind. First was that all border fabric would come from my stash and second was that the outer border would be blue to relate to the baskets. 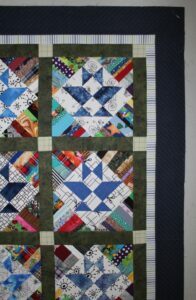 The third goal (and the one that I thought would be the hardest) was to somehow transition from the green sashing to the blue outer border. Luckily I found the perfect stripe for the inner border. It is a blue/green/white stripe from a recycled men’s shirt. The binding is going to be the dark green sashing fabric. 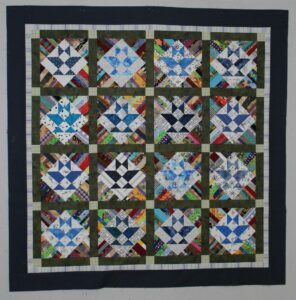 The quilt top measures 50 1/4″ x 50 1/4″ – a couple of inches smaller than Bonnie’s version. My sashing strips are cut 2″ instead of 2 1/2″ and the blue outer border is 3 1/2″ instead of 4″. Your projects are always so eclectic! Every time I see your Charlotte’s Baskets I am reminded that would be a great project for my string blocks. I never know what is going to attract my attention. For the last couple of months I have been looking at baskets with flowers blocks. Charlotte’s Baskets is a great way to use your string blocks and you could substitute any 6″ finished block that you want.